natural beauty of the Region, but not yet focused on nature based activities in the many protected areas. tural assets of this region. change, local social (including cultural) and ecological systems. ferent changes to local communities. level of perturbation they bring to the receiving tourism system. tion preferences, 8) transportation style and 9) the level of use. haps becomes rapidly dated in a scenario of rapid change. consumption, while tourist demographics had no correlation. ness travellers spent significantly more than pleasure travellers. 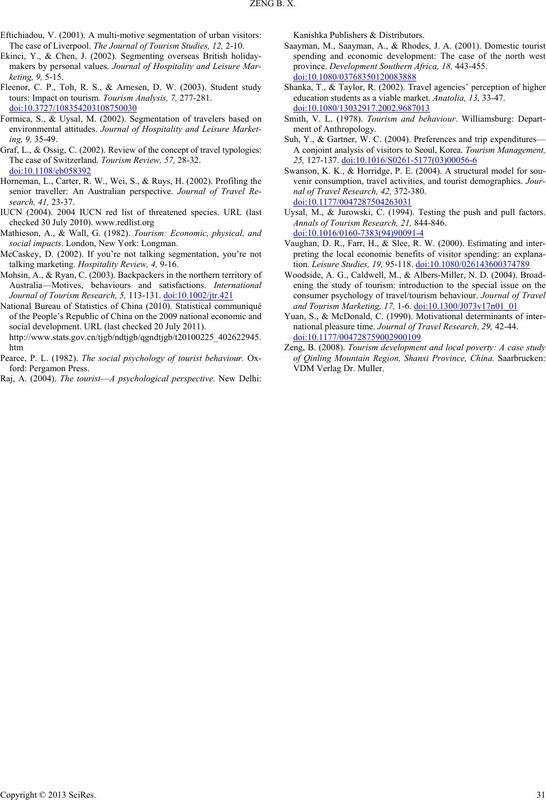 travellers with similar tourist profiles (Mohsin & Ryan, 2003). ism development based on the findings. duction (GDP) than the provincial average (Zeng 2008). the increasing number of tourists. and flow to, and through the community. experiences rather than general holidays in a natural setting. potentials to attract more external visitors interested in nature. posable income or minimal income. status of the majority of visitors. the Park management sector to respond to increased demand. ested in visiting the Region, including international visitors. their way of living to enter the tourism system. the provided list of pull factors (Table 2). first in their priorities, while all domestic groups rank it lowest. the variability given to ranking price and service. public servants, company staff and professionals. 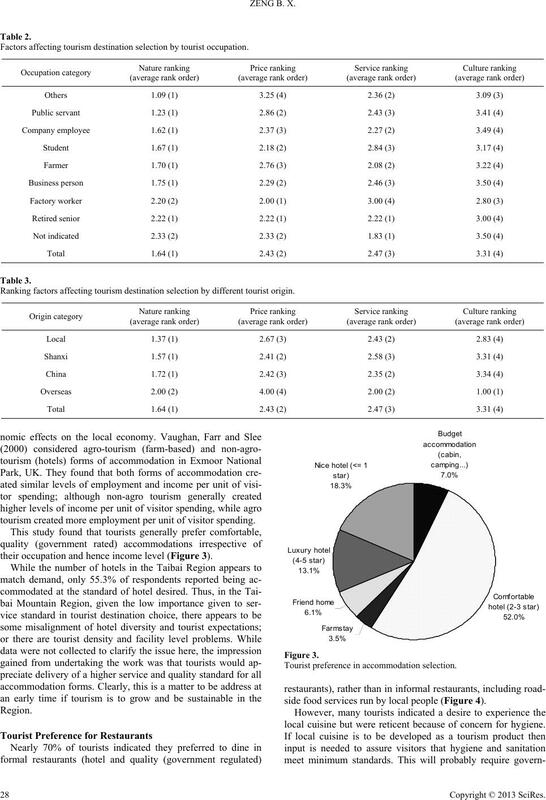 Factors affecting tourism destination selection by tourist occupation. Ranking factors affecting tourism destination selection by different tourist origin. tourism created more employment per unit of visitor spending. their occupation and hence income level (Figure 3). 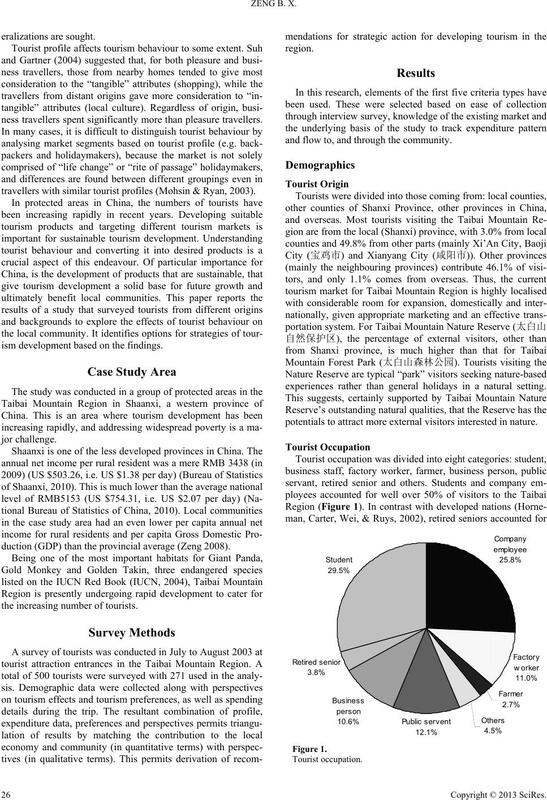 Tourist preference in accommodation selection. side food services run by local people (Figure 4). local cuisine but were reticent because of concern for hygiene. Tourist preference in restaurant selection. serve tourists with local special traditional food. pends on the extent of leakages from the economy. 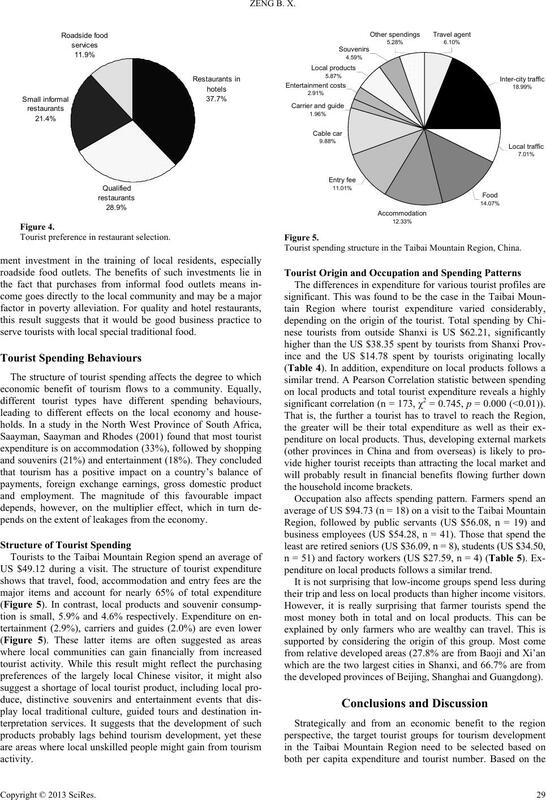 Tourist spending structure in the Taibai Mountain Region, China. significant correlation (n = 173, χ2 = 0.745, p = 0.000 (<0.01)). penditure on local products follows a similar trend. their trip and less on local products than higher income visitors. the developed provinces of Beijing, Shanghai and Guangdong). Tourist origin and tourist spending. Tourist occupation and tourist spending. and at a reliable standard of quality. ture patterns both in total and on local products during their trip. terventions are needed realise both tourism futures. The case of Switzerland. Journal of Travel Research, 41, 68-76.
ment. URL (last checked 20 July 2011). 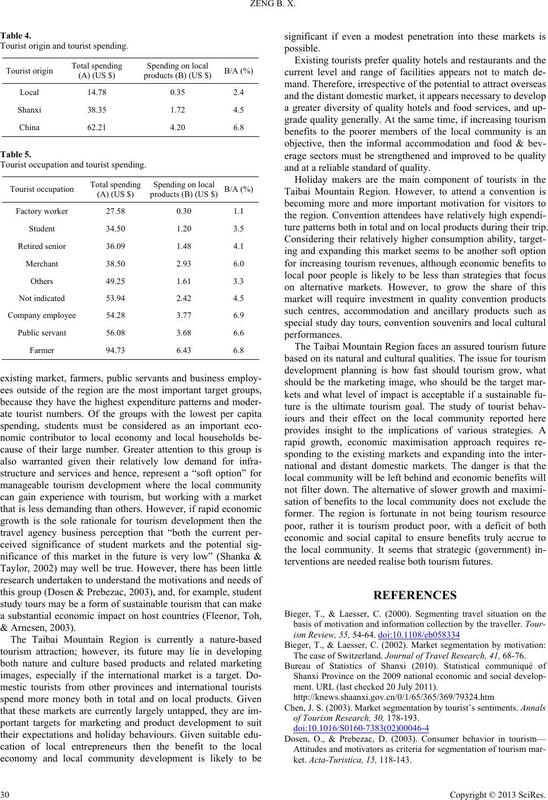 of Tourism Research, 3 0 , 178-193. The case of Liverpool. 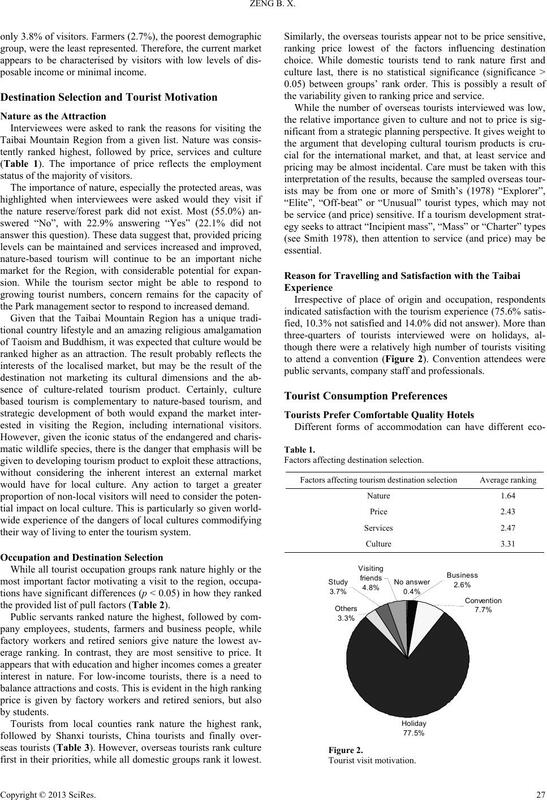 The Journal of Tourism S t u di e s , 12, 2-10.
tours: Impact on tourism. Tourism Analysis, 7, 277-281. The case of Switzerland. 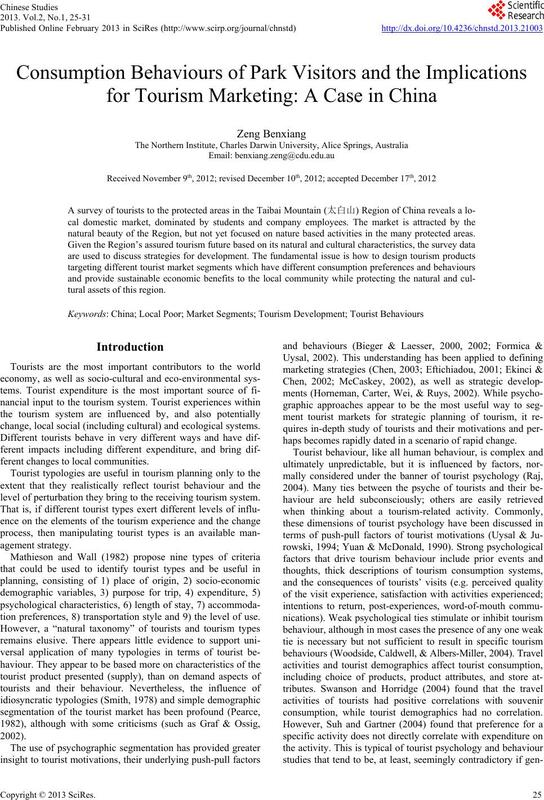 Tourism Review, 57, 28-32.
social impacts. London, New York: Longman. talking marketing. Hospitality Review, 4, 9-16.
social development. URL (last checked 20 July 2011). province. Development Southern Africa, 18, 443-455.
education students as a viable market. Anatolia, 13, 33-47.
nal of Travel Research, 42, 372-380. Uysal, M., & Jurowski, C. (1994). Testing the push and pull factors. Annals of Tourism Resear c h , 21, 844-846.
national pleasure time. Journal of Travel Research, 29, 42-44.